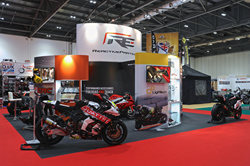 Quadrant2Design have designed and built an exhibition stand for the UK's leading Motorcycle Performance Parts outlet, Reactive Parts, and their upcoming show at The Carole Nash MCN Motorcycle Show at London's ExCeL. Reactive Parts had a very successful time at the 2015 MCN Motorcycle Show. The UK’s leading Motorcycle Performance Parts outlet, Reactive Parts, has been supplying premium race equipment for over ten years. Initially opening in 2002, and retailing only to factory racing teams in MotoGP, World Superbikes, and British Superbikes, 2010 saw the company open their doors to all racers. Run and staffed by Isle of Man TT Racers, British Superbike Racers, and Club Racers, the Reactive Parts team know everything there is to know, ensuring that their customers have only the best available. This month will see the team returning to The Carole Nash MCN London Motorcycle Show, which takes place at London’s ExCeL from the 12th – 14th February 2016, after a hugely successful exhibition last year. The show is the only event in London where visitors have the chance to see the greatest in the latest motorcycles. With live-action stages, the celebration of the British Superbike 20th Anniversary, and the unveiling of a brand new motorcycle live at the show, the MCN Motorcycle Show is the ultimate event for any biker. Reactive Parts will be showcasing their unbeatable knowledge, top quality products, and fantastic service on stand R730, at the show. They will be showcasing the newest products for the latest motorcycles with the aid of a Prestige Event Stand from the Poole-based exhibition stand specialists, Quadrant2Design. Modular, and portable in design, the re-usable stand boasts integrated showcases and LCD TV’s, meaning that Reactive Parts can show off their products and knowledge to all visitors at the show. For more information about Reactive Parts, or to view their stock and purchase from their online store, visit http://www.reactiveparts.com or call 0844 414 5412. To buy tickets to the Carole Nash MCN London Motorcycle Show, visit http://www.mcnmotorcycleshow.com.